By Trevor McIntyre: WBC World flyweight champion Charlie Edwards (15-1, 6 KOs) easily retained his title in beating an embarrassingly limited #14 fringe contender Angel Moreno (19-3, 6 KOs) by a one-sided 12 round unanimous decision on Saturday night at the Copper Box Arena in London, England. The judges’ scores were 120-107, 120-107 and 120-107. Boxing News 24 scored it 120-107. This was an impressive performance from the 26-year-old Edwards, who showboated and dominated the 35-year-old Spaniard Moreno in winning easily. After the fight, Edwards and his promoter Eddie Hearn of Matchroom Boxing promoter Eddie Hearn spoke of wanting to unify the flyweight division. 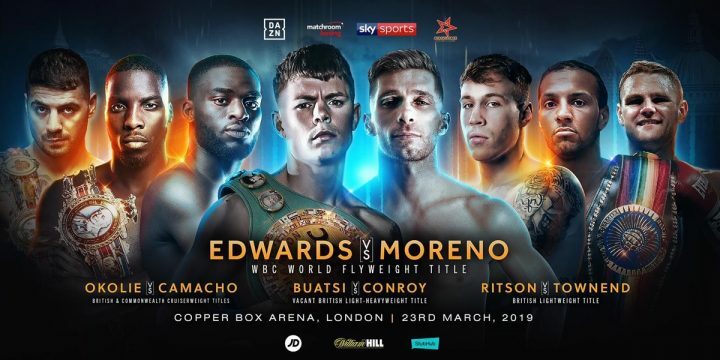 It would be nice to see Edwards fight better opposition than Moreno Even if Hearn has problems putting Edwards in unification fights, he should at least aim to put him in against higher level opposition than looking for bottom feeders like Moreno. It was so one-sided that it was hard to watch. Moreno looked like he had no boxing skills whatsoever. You have to wonder what Eddie Hearn was thinking of in putting this fight together. The showboating that Edwards did was unnecessary, as it seemed almost cruel given how limited and over-matched his opponent Moreno was. There are times when showboating is fine, but not when a fight is as one-sided as tonight’s contest was. Undefeated 2016 Olympian light heavyweight Joshua Buatsi (10-0, 8 KOs) stayed unbeaten with an easy third round knockout win over an overmatched Liam Conroy (16-4-1, 8 KOs) to win the vacant British light heavyweight title. Buatsi, 26, knocked Conroy down twice in the third round. The referee stopped the fight after the second knock down. Buatsi knocked Conroy down hard with a right to the head. When he got back to his feet, he looked shaky, so the referee pulled the plug on the fight. The official time of the stoppage was at 1:53 of round 3. In the first knockdown, Buatsi landed a big right hand followed by a left hook that dropped Conroy. Conroy landed some shots in the fight, but he was too slow of hand, and his wide defense made it easy for Buatsi to land his big shots. Matchroom Boxing promoter Eddie Hearn plans on putting Buatsi on the undercard of IBF/WBA/WBO heavyweight champion Anthony Joshua’s next title defense against Jarrell ‘Big Baby’ Miller on June 1 at Madison Square Garden in New York. Hearn didn’t say who he plans on matching Buatsi up against, but it should be a step up from the 26-year-old Conroy, who was no competition tonight. Overall, Buatsi looked good, but he doesn’t look to be on the same level as fighters at the world level like Dmitry Bivol, Artur Beterbiev, Sergey Kovalev, Oleksander Gvozdyk, Marcus Browne and Badou Jack. Right now, Buatsi would likely come undone against Callum Johnson. Buatsi looks more like a super middleweight. He would do well to try and drop some weight, and move down to 168 to eventually test WBA super middleweight champion Callum Smith, WBC champion Anthony Dirrell or IBF champion Caleb Plant. British cruiserweight champion Lawrence Okolie (12-0, 9 KOs) stayed unbeaten with a fourth round knockout win over Commonwealth champion Wade Camacho (21-8, 12 KOs) on Saturday night at the Copper Box Arena in London, England. The 2016 Olympian Okolie, 26, dropped Camacho with a series of hard shots in the fourth round. The badly hurt 33-year-old Camacho got back to his feet, but he took a big right hand from Okolie that shook him up. The referee then stepped in and halted the fight. The official time of the stoppage was at 2:00 of round 4. In round one, the two fighters started slowly. Camacho was connecting well with his jab. The lanky 6’5″ Okolie was trying to connect with big shots, but missing wide of the mark. Near the end of the round, Okolie finally landed a nice left hook to the head of Camacho. The shot seemed to get Camacho’s attention. With the win, Okolie is done all he can fighting at the domestic level. He’ll either move up to the European or at the world level. Okolie has the power to mix it at the world level, but he’ll need to pick his spot where he wants to go after a title. Right now, Okolie would have problems against guys like Yunier Dorticos, Denis Lebedev, Murat Gassiev, Beibut Shumenov and Krzysztof Glowacki. The good news is Gassiev is expected to move up to heavyweight. That’ll clear him from the division. Oleksander Usyk is moving up to heavyweight as well, which will open up all the belts. Matchroom Boxing promoter Eddie Hearn is talking of wanting to put Okolie in with 39-year-old former WBA cruiserweight champion Denis Lebedev (32-2, 23 KOs). That might be too much of a move up for Okolie, as the southpaw Lebedev is still fighting at a high level. “I believe he can beat Denis Lebedev now, but it’s just about the risk versus the reward, and whether his team want to go for the gamble,” Hearn said. It might be better for Hearn to match Okolie against a world class level cruiserweight by having him fight a two or three contenders before he puts him in with Lebedev. “I’ll definitely fight Lebedev,” Okolie said. Okolie has some talent, but he needs to get some experience before he faces some of the better fighters in the division. Light welterweight Lewis Ritson (18-1, 11 KOs) easily defeated German Argentino Benitez (21-4, 9 KOs) by a one-sided 10 round unanimous decision to capture the vacant World Boxing Association Inter-Continental Super Lightweight Title. The judges scored it 98-92, 98-92, and 99-91. Boxing News 24 scored it for Ritson, 25, by a 98-92 score. It was a good bounce back victory for Ritson, who had lost his previous fight to Francesco Patera by a 12 round split decision in a failed attempt to win the vacant European Boxing Union lightweight title. Former British lightweight champion Ritson didn’t have the skills needed to him to deal with Patera’s aggressive style. Tonight’s fight was far from an easy one for Ritson, who had a tough time beating a very determined but limited Benitez. Ritson’s lack of punching power was worrisome. He’s going to need to be able to come up with more punching power if he plans on being a factor in the 140 lb weight class. Ritson had good pop in his punches when he fought at lightweight, but it’s going to be a different story at light welterweight. He doesn’t look nearly as powerful in this weight class as he did at 135. Hearn wants to move Ritson quickly by having him go after the winner of the Joe Hughes vs. Robbie Davies Jr. fight that takes place next Saturday night. Hughes holds the EBU light welterweight title. After failing to win the vacant lightweight EBU belt, it might be a bridge too far to have Ritson go after EBU 140 lb champion Joe Hughes.